My gluten-limited son told me this week that he's a little tired of the gluten free asiago cheese bagels that I've been feeding him every morning. I just purchased a new 25 pound bag of Better Batter Gluten Free Flour, so it was time to try some new bread recipes. French bread seemed like a pretty good start, so I went to BetterBatter.org and found a French Bread recipe and adapted it to make rolls. The results are awesome. Every time I make a new bread with this Better Batter flour, I'm amazed at how normal the bread looks. And it tastes good too. I mean, it doesn't taste exactly like wheat flour, but the texture is so close, and the flavor is so mild, that if you're a person who's gone without wheat bread (or suffered through some less-than-ideal substitutes), I'm almost certain that you will be pleased with this bread. My other son who is not gluten-limited even told me these were great. Another thing I love about the recipes with this flour is that they only call for a single rise, so you're finished with your bread baking in half the time it would take using wheat flour. So there. DISCLAIMER/WARNING: The "dough" for these rolls is more like a thick batter, but the rolls bake up nicely. They are better if you let them cool all the way before eating them. You can re-heat them, but some of the water evaporates as they cool. They dry out even more and do even better after freezing, believe it or not--but even then, be prepared for a moister texture than wheat bread. Sorry. I think it's just the nature of gluten-free grains. At least that's what I've seen so far. Line a cookie sheet with parchment paper (or grease it) and sprinkle with the cornmeal. Set aside. In the bowl of a standing mixer fitted with the paddle attachment, mix the water and the yeast. Allow to sit for five minutes to soften the yeast. Add the flour and the salt. Beat on low until flour is all wet, and then beat on high for 5 minutes. 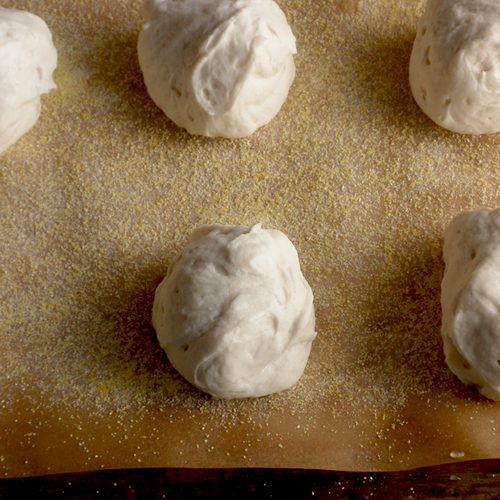 With wet fingers, gently smooth out the rough spots on the dough blobs. They don't have to be perfect, just not jagged. Allow to rise for about 35-45 minutes. Place in the preheated oven and throw four ice cubes into the bottom of the oven to produce some steam. After 6-7 minutes, put in four more ice cubes and bake for another 11-13 minutes, or until rolls are nicely browned. Remove from oven and cool rolls on a wire rack. Unbaked dough blob sitting there to rise. 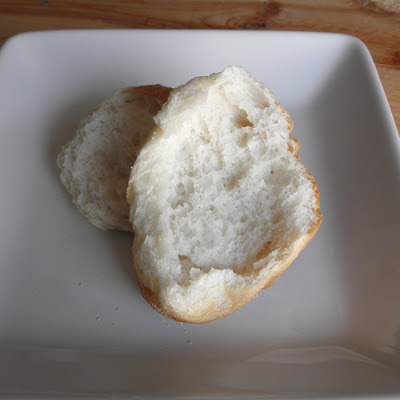 Hello, I made these rolls exactly as the recipe stated & the taste was great but they were gummy inside...is this just the way all GF breads are or am I doing something wrong? They looked, smelled & tasted awesome but they were so gummy inside I couldn't eat them - I just peeled off the crust and ate that. Thanks for any help! They are slightly gummy for me. I've taken to letting them rise a little longer and baking a little longer. I also find that they texture is better after they've cooled completely and then heated again if you want them warm. Most bread is actually like that, but GF in particular. I hope trying one or more of these ideas helps. One more idea--lower the oven temp to 425 and bake an extra 5-7 minutes. Just an idea that I should try myself. Seriously. How the heck do you make the dough actually stay in any kind of form?! Unfortunately I cannot get this flour in the UK - can you suggest an alternative please? I made those, but found that the emount of flour in the recipe makes the dough way too soft and runny to form into balls. I added a lot more flour and they didn't really brown at all but tasted really good. I should post a picture of how wet the dough is when I "form" the rolls. It's more of a fluffy batter than a dough, and I scrape it out of a measuring cup onto the baking sheet. Glad they tasted okay. Did you try the ice in the bottom of the oven? Maybe that has something to do with the browning, but that's just a guess. I did not have better batter gluten free flour so I substituted with 2 c of quinoa flour and 1 1/2 c of aller purpose gluten free flour... The result was too runny and it did not raise at all! I'm planning on trying this again... With all purpose gluten free flour only... Should I reduce the amount of water? It seems like every gluten free flour behaves differently, which is why I specify in my GF recipes which flour I used. I only know how these rolls do with the Better Batter AP flour. You'lol just have to experiment, I think, if you are using a different type/brand of GF flour. Sorry I don't have a clearer response than that for you. I wish I read the comments. Something is really wrong with this recipe. Too much water maybe! I tried to fix it by adding more flour. I hope this does not end up being a total waste of ingredients. It was, unfortunately, waste of ingredients and the dough was totally liquid. Adding more flour did not fix it. The taste became horrible. I'm sorry it turned out horrible for you. I know it's a disappointment and frustrating because the flour is not cheap. I hope you are able to find a recipe that you like. Have you looked on Gluten Free on a Shoestring? That blog is exclusively gluten free and she has a ton of great recipes. Good luck! I used the mock better batter and it came out very runny...too runny to keep in balls. I'm used to making a gf french bread that turns out really doughy, but holds its shape like the picture of your rolls in dough form. I have the batter in a bowl and letting them rise like regular bread before I attempt to make rolls out of them. We will see! Otherwise I will go back to my original non fail gf french bread recipe. Hmmm...how did they turn out? I've never tried making my own Better Batter flour. Each GF flour behaves so differently that I think they each have their own recipes that work. 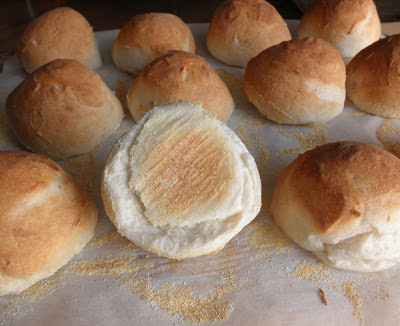 I don't know if I was clear in the instructions, but for these rolls, you only let them rise once--you mix the dough/batter and then scoop onto pans, raise, and bake. Please let me know what ended up happening with yours. Could you share your original non-fail gf french bread recipe? My husband would be soo thrilled. Since I couldn’t find “Better Batter Gluten Free Flour” nearby, we used a copycat. The following makes 1 cup (140g). Your recipe requires 3 ½ cups, hence you should do the multiplications. - Preheat oven to 450 degrees Fahrenheit. - Prepare the yeast: Yeast can be tricky. It requires certain precision on the temperature to be activated (between 100 and 110 F) and a 1 teaspoon of sugar to proof it. Tiny secret but works well! - In the bowl of a standing mixer fitted with the paddle attachment, mix the water and the yeast. Add the flour and the salt. Do it in halves: Put 1 cup of the warm yeast + half of the flour. Mix it 20 secs (just to combine the elements). Then add all the flour and another cup of the yeast. Save the remaining 1/2 cup. Add it while mixing it (you will see if the dough is either “too dry” or “too runny”). - Beat on low until flour is all wet, and then beat on high for 5 minutes. - Using a 1/3 cup measuring cup, scoop batter and then scrape out with a silicone/rubber spatula, making the dough blobs as round as possible. Space blobs about 1 1/2 inches apart. (I fit only 9 on my pan, but I could have made all 12 on one pan.) I used an ice-cream scooper. It’s much easier, faster and all the rolls will have the same size & shape. - With wet fingers, gently smooth out the rough spots on the dough blobs. They don't have to be perfect, just not jagged. - Place in the preheated oven and throw four ice cubes into the bottom of the oven to produce some steam. After 6-7 minutes, put in four more ice cubes and bake for another 11-13 minutes, or until rolls are nicely browned. After baking, I go with 1 or 2 minutes of “broiling” to get the nice color. 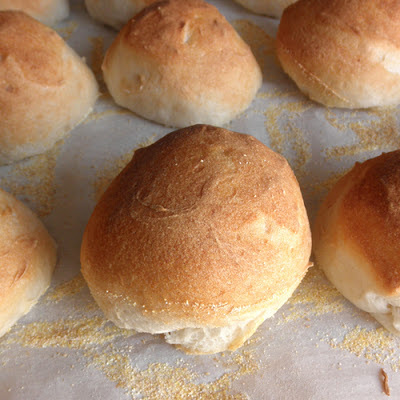 - Remove from oven and cool rolls on a wire rack. - Makes 12 rolls depends on the size of the scooper, I got 15! I think what we call “broiling” in the US is called “grilling” in Australia. It’s when you turn the oven heat on maximum and place the food directly under that heat so hat it browns relatively quickly. Does that make sense? Wow, this is entirely liquid. Like, you could drink it. Really disappointed. There goes rolls at thanksgiving. Well that stinks. Did you use Better Batter flour?